We have the 100th Casology challenge, super! This weeks cue word is CELEBRATE. I wanted to make super funny card because celebration should be funny! I took funny cat from NINE LIVES stamp set (Penny Black) and sentiment from the same set. I stamped them with memento, coloured cat with Copics and add shimmer with Wing of stella silver brush. Than I masket both and over confetti stencil (which I cut on my Silhouette Cameo) I made background with Tim Holtz`s spritzer – it is new for me and I love it!! I used Copics and it works so good. And finally I added some sequins and enamel dots. So here it is my celebration card. Happy Birthday Casology! This entry was posted in Challenge and tagged cardmaking, Challenge, Copic, Penny Black, silhouette, stencil. This cat looks oh so happy! What a perfectly clean and simple card! So glad you joined us at CASology this week! Wow I want that stamp set. Cute card. Kate, this is adorable! 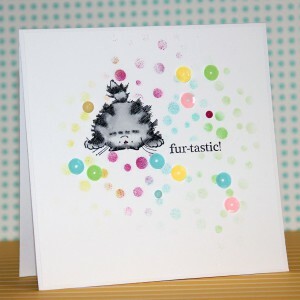 Love that cute kitty and the fabulous confetti background you created! Thanks for playing along with CASology this week! This is so cute!!!!! Love your confetti background! Thanks so much for playing with us at CASology.